Giant-Size Geek: Green Lantern 1970 DC Comics ad: To Do Or Die? 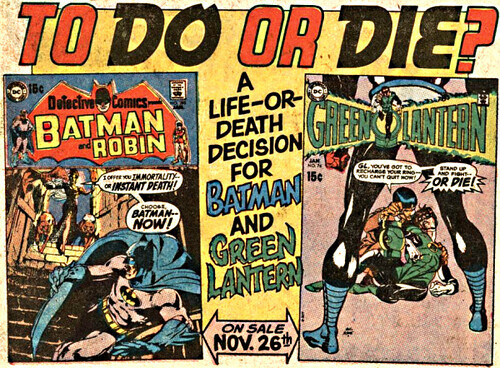 Green Lantern 1970 DC Comics ad: To Do Or Die? One thing I noticed only after posting yesterday's look at various Green Lantern covers by Gil Kane was how many of them teased the reader with the death of Hal Jordan! I always loved the DC Comics ads that paired up two characters. Sometimes the pairings were illogical! I remember seeing this ad for GL #70 and Detective Comics #395. They got me with this one, I bought them both. Nuff said.